The last time I was in this area, 20 years ago, I went on a flight out of Cozumel to see the huge Mayan ruins, Chichen Itza. I have always wanted to go back, so I arranged for 3 of us to do just that while our ship was in Cozumel. The plane sometimes does a fly-by of the ruins, but we had fairly bad weather, so this picture is from 20 years ago. It's a huge area of ruins, but you can see the 3 main areas here -El Castillo in the center, the Temple of the Warriors in the upper left, and the Ball Court in the lower right. Our tour included a tour guide, and we went first to see El Castillo. The pyramid was built with the Mayan calendar in mind. And on the spring or fall equinox, the setting sun forms a snake pattern going up the stairs. Most of the sides of the pyramid have been reconstructed, but one side is left more or less as it was found. This is an artist's interpretation of how it was found. And this is one of the earliest pictures. You can no longer climb up any of the structures, but you could 20 years ago. This was the view from the top of El Castillo looking towards the Temple of the Warriors and the surrounding structures. This was the view we got this time. You can barely see the figure of Chaac-Mool on the top. You can see him better from this 20-year-old picture. Chac-mool was an intermediate between men and the gods. Notice the small dish that would have been used for the receiving of sacrifices. A different view of the Temple of the Warriors and the Group of the Thousand Columns. Since I was there last, hundreds more columns have been recovered from the rubble and put in place. Next door is the Temple of the Large Tables, which has not been completely conserved. Another highlight of Chichen Itza is the Main Ball Court, the largest and best preserved anywhere, and only one of nine ball courts built in the city. The goal was to get the ball through this ring without using your hands. And if you win? Your captain gets sacrificed! On the nearby Platform of the Jaguars and the Eagles are reliefs of both jaguars and eagles clutching human hearts. The nearby Wall of the Skulls could represent the sacrificed ball players or their dead enemies. The Mayans were really into astronomy, as evidenced by this Observatory. They perfected a solar calendar of 365 days. Close to the Observatory is a building called The Church, although its actual use is not really known. And the Nunnery. I don't know why it's called that because they didn't have nuns. We were getting a little nervous about getting back to the ship on time, so we skipped lunch and went right to the very busy Chichen Itza International Airport. Ours was the only plane in sight. Except for these planes that aren't going anywhere soon. We got a great view of the ship on our way back to the Cozumel airport, and made it back to the ship in time. It was a fantastic trip! Next stop - back to Tampa. Costa Maya is not really a town, but a place built on the Yucatan peninsula of Mexico just for cruise ships. The ships dock at the end of a really long pier. Notice the plate on the rope to keep critters from climbing aboard. Of course there's a lighthouse. And the newest Mayan ruin - only 6 months old! The area was hit by a hurricane in 2007, so everything is pretty new. The big Mayan temple here is actually a water park. We were welcomed ashore by some strange animals. I think we're getting the evil eye for not tipping them. In the morning, Phil and I rented a golf cart and explored the nearby town of Mahahual. And looks like a great RV parking spot. Is this Groucho or Harpo? These termite nests were all over the area. We also saw them in Honduras and Belize. Someone enhanced the crosswalk sign. So what if you run out of one color of paint - just carry on with another. In the afternoon we took a cab back to town to go to the beach. We went snorkeling, but I forgot my underwater camera, so no pictures. On the way home, I got attacked by a crocodile. We had dinner with the ship's singles group - the 6 of us and 4 of another group. Our next stop, Belize City, was the only one where we had to take a tender to get to the shore, because of the large barrier reef here. And it was a very long tender - you can barely see the city in the picture. Once again, I made arrangements to go on a shore excursion booking directly with the company instead of going through the ship, for about half what the ship charges. Three of us are going to the Mayan ruins of Lamanai. It's quite a journey - 1 hour in a van, and then 45-minutes on a high-speed boat down the New River. I really enjoyed it because we got to see a lot of the countryside. And a little baby crocodile when we first got on the boat. From there on it was high speed only! Here's a short video to show just how fast we were going. 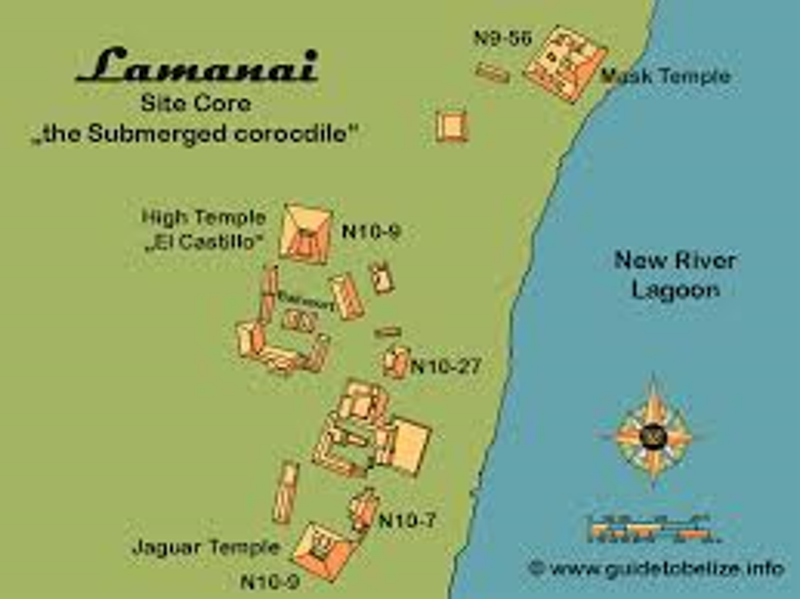 Lamanai is located on the New River Lagoon and was excavated just 30 years ago. 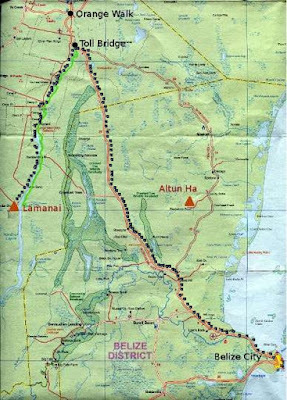 Three major temples have been uncovered, and more are waiting to be found. 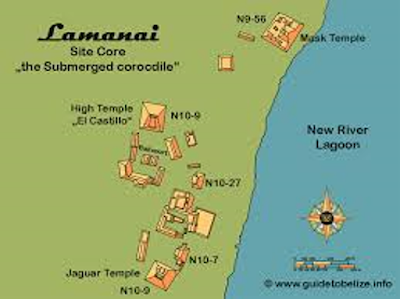 "Lamanai" is the Mayan term for "submerged crocodile." So named because of the jaguar heads that adorn each of the front corners. From there we headed over to the High Temple. You used to be able to climb up the front using a rope, but it was causing too much damage, so now they have built modern stairs in the back. I went part way up to get a closer view of the eroded faces. Our last stop was the Mask Temple, which features 13-foot tall masks of an ancient Mayan king. These masks have been reconstructed, because they were too decayed. Here's a short video of Julian trying to explain the Ball Court, while we were distracted by the roaring of the Howler Monkeys. He finally gave up and took us to see them. We then got back in the boat and zipped back to our lunch spot. This Spider Monkey was waiting for us - I think he's used to getting treats. Phil was happy to oblige. We got a very nice buffet lunch. They tried to tell us that was iguana meat, but it was really chicken. The fried plantain was the best! And then back to Belize City on the van. We made it to the tender in plenty of time. Tonight our towel sculpture was a little easier to recognize.